Making a mountain out of a mole hill! It was time for Everest summit part two. Having successfully ascended the equivalent height of Everest on a climbing wall, I was looking to achieve the same feat but on a mountain bike up a local hill. 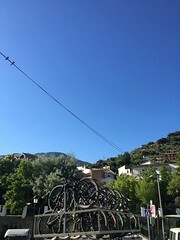 “Everesting” by bike has become increasingly popular in recent years. There is a website dedicated to it with a guideline to the rules you need to follow in order to make it onto their wall of fame (see link below). The premise is simple; pick a hill and ride up and down it the required number of times to reach the vertical height of 8,848mts. There is no time limit but you must remain on the hill throughout the challenge, you must come down the same way you went up and you also have to keep a log of your attempt on a GPS device or equivalent. 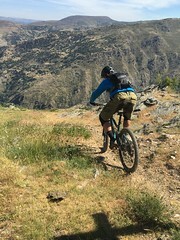 Some people pick long steady climbs needing only a handful of repetitions, others prefer the shorter steeper climbs meaning you have to go up and down over one hundred times. Most opt for something in between the two. It is a balance between being able to spin out the legs and get a good rest on the way down. The majority of people attempt this physical and mental test of endurance on a lightweight carbon road bike. The stiffness and weight benefits are obvious; it makes for smooth climbing and allows you to relax on the descent. 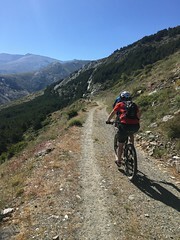 More fool me, I chose to do my attempt on a heavy mountain bike and to make it even more difficult for myself I chose a hill that was steep, long, windy and in large parts made up of rough track with obstacles across it! The total length of the hill was approximately 1.2 miles and the height gain around 192m this meant I had to climb it 46 times. This kind of event is a very difficult one to train for, I keep myself fit and I practiced the ascent on a number of different occasions in the lead up to the actual attempt. The most I did in one go was 5 taking around 80 minutes. I felt comfortable and thought that just repeating that 9 times on the day would be simple. In reality this meant I would be on the bike for at least 15 hours. That is 900 minutes on the same bike going up and down the same hill. I was to realise very quickly just what that meant in terms of pain and suffering! Preparation for the ride on the day was good. We had aimed to start at 5:30am. I was fortunate to once again have the support of friends and family on the attempt. There were four of us starting the challenge, two of them would also be attempting the entire ascent. With the promise of more people joining us throughout the day I felt I had enough support and was grateful for the company. It hopefully meant that boredom would not be a factor. I had also planned a “base camp” where my wife and other volunteers set up tables and chairs and were to give support not only to the riders but also to offer teas, coffees, cakes and buns to people who came along to cheer us on and also importantly, to collect donations for the charity for which i was raising money – Raleigh International. It wasn’t all smiles and sunshine! Although we would be setting off in the dark on our own, I felt everything was in place to make the day a success. As I stepped out of the warm van into the cold morning air it was with a slight sense of dread. Most of the challenges I have undertaken have involved a journey; not knowing what is around the next corner or over the next hill helps to drive me on and satisfies the explorer in me. This was going to be as much a mental journey as a physical one. Repeating the same arduous feat again and again, not knowing if it was even possible, made it exciting for me but at the same time daunting. Out of the dim gloom of dawn the bright bike lights of my colleagues approached and I knew there was no backing out. In stark contrast to the waking birdsong our conversations were muted at first. It was cold and raining and there was a palpable air of anticipation. Or possibly dread! 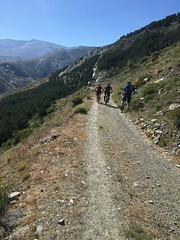 Another rider joined us mid-morning and rode the next 4- 5 ascents with us. After 90 minutes he acknowledged how tough it was and wishing us luck departed. A large part of me wished I was going with him! After 3 hours we had managed around 12 ascents, 34 to go. It really did feel like we still had a mountain to climb. On a more positive note the “base camp” was up and running. Lots of early morning risers, friends, family and curious by-passers had come to see how we were getting on. There was a great atmosphere developing as teas and coffees were handed out. Friends came along in running gear, some with dogs in tow, some with children, all with a sense of curiosity about how we were getting on. They would run alongside us and all too often ahead of us as we slowly ground our way up the hill. Time seemed to stand still for the next few hours, up and down we went like the Grand old duke of York. Although unfortunately most of the time I was feeling more like Jack or Jill. Our attempts to stay together as a group slowly but inevitably began to disintegrate. As anyone who regularly rides a bike will know you need to cycle at your own pace, particularly when climbing. Speed will vary depending on your riding style, level of fitness, length of your leg, type of bike etc. Trying to stay together, we re-grouped after every descent but as the crowd grew around basecamp so did our enthusiasm for setting off back up the hill and very quickly after setting off again we split up on the climb. Heavy bikes and a steep hill meant we were cycling at a child’s walking pace!! After 10 hours we really slowed down and a dawning realisation crept up on me that perhaps we had bitten off more than we could chew. The forecast for the evening was for more rain, most of the supporters had departed and my legs were hurting. In particular I was starting to suffer with acute pain in my right knee. I quickly made my decision, we would retire after reaching 5,000mts, around two thirds of the way up Everest. So reluctantly, after 27 ascents and descents, we called it a day. I felt disheartened but not defeated. We had given it a good go, we had raised over £600 on the day and a lot of awareness for Raleigh International. An hour later, sitting with a pint in my hand looking out at horizontal sleet, I felt justified in finishing prematurely. We reflected on the day and made suggestions as to what we would have done differently to achieve the summit. The consensus was that it could be done on a more gentle, straighter slope. This would increase the number of repetitions but wouldn’t put such an impact on the muscles and joints. It remains to be done and before I head out to Nepal I hope to be the one to do it! Thank you to all those who supported and helped us on the day and continue to support me in my efforts. That’s a grimace not a smile…….